Just getting started with competency-based management? You've come to the right place. These curated guides cover some of the basic concepts you'll need to fill in the gaps and continue your journey; you'll get dozens of useful tips to help you fulfill your HR mission. Sign up below to access these resources and subscribe to the bi-weekly HRSG blog. It can take weeks of stakeholder engagement to find competencies for your jobs. CompetencyCore’s AI analyzes millions of data points to generate results instantly. 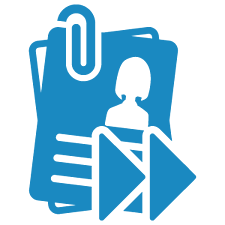 Use our free tool to paste in any job description and see it in action. 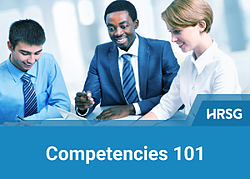 This eBook covers the ABC's of competencies: what are they? How do they work? And most importantly, what are the benefits of a competency-based approach to talent management? Learn how competencies can make a positive impact on all phases of your talent management programs. 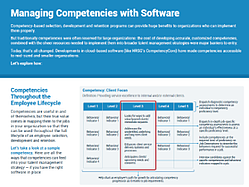 Take a look at a sample competency, and all the ways that competencies can feed into your talent management strategy — if you have the right software in place. This guide covers the benefits of a competency management software system. 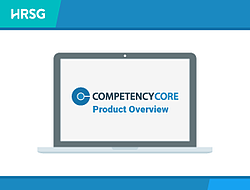 An overview of CompetencyCore software, exploring how the software helps you fulfill your HR mission to hire, retain and develop your best people. Where should we send your competency toolkit?